As someone who had to recently go through this process I would say I’m well placed to offer some sound advice to men looking to pop the question. Maybe Valentine’s Day cemented the thoughts in your mind that he/she is ‘the one’, or you have been toying with the idea for some time. Either way you have found yourself here, actively researching the best way about purchasing the most important piece of jewelry you will ever buy. Read our easy guide to buying an engagement ring. It is a big conundrum that men will face when doing their research but if you have discussed marriage with your nearest and dearest then more than likely she will have left some clues. I was lucky enough that my girlfriend had a Pinterest board dedicated to weddings which had a majority of emerald cut engagement rings included, so I knew I was on the right track with that style. If she hasn’t made it that easy for you then speak to her friends and family with whom she will have likely had relevant conversations with. But in all honesty if you know her well then you know what she wants. Be confident and typically your gut instinct will be right. Have a look at her other jewelry and see how it matches her personality. Maybe she is someone who has bags of confidence and loves to grab attention with a bit of bling. Or alternatively she may be more reserved and would like a ring that is more understated and traditional. This is what every man should be looking for when purchasing an engagement ring. This four way combination can alter the price considerably depending on which one (or all) gets pushed up the scales. Do not fear gentlemen, we will run you through the four c’s and offer some shopping recommendations along the way. The weight of the diamond is measured in carats and it is probably the one of the four c’s most men are more familiar with. A carat diamond is equal to 200 milligrams (0.2 grams) and is divided into 100 “points”. Therefore a 3/4 ct diamond is 75 points or 0.75. carats. During research men may find the same carat diamond with varying prices, and this is because the other c’s are having an effect on this. Although the carat is the most influential proposition to the price of the diamond. Top Tip: Look for carat weights that are just below or above popular weights like 0.71ct instead of 0.75ct for example. A diamond is made in essence of carbon, so a 100% pure carbon diamond would be completely colourless should it have no impurities. Top Tip: A G-H grade will be almost colourless to the naked eye and would be our recommended choice when buying a diamond. Engagement ring clarity is referring to the blemishes on the diamonds surface as well as inclusions within the actual diamond and the colour of those inclusions found. The gemologist will then grade the diamond after viewing it through 10x magnification. It is worth noting that clarity is the second biggest influence on the price of a diamond. Top Tip: You do not have to buy a high clarity diamond to get the best option, cut grade is what determines the sparkle. Look at getting VS2 which can look exactly the same to some of those diamonds higher on the scale. With more than 230 years of history, Goldsmiths is now the biggest high street jewellers in the UK, and offers a wide variety of brands including Canada Ice and Vera Wang. Covering all budgets, the selection of engagement rings is bound to have her favourite brand included making sure you have already ticked off a key point before she opens the box. As with any retail outlet there are margins to be kept to. Markups on branded jewelry are going to push the price of your chosen ring up. I would strongly suggest using the site to re-enforce your chosen style and cut before having the ring custom made. If you want to get the most for your budget and aren’t worried by brand names then going custom will ensure more bang for your buck. Blue Nile are our introduction to buying custom engagement rings online. This may be a preposterous idea to some, but e-commerce has advanced and this is nowhere near as scary as it might have initially sounded. The security on offer from both banks and websites ensures that your money is safe while the ring has guarantees to make it safely to your door. A fantastic price on engagement rings that you won’t find with your high street retailer, hence why they have become one of the pioneers of this new world of purchasing diamonds online. I was actively going to purchase my ring on my early research but on further investigation I was put off by a couple of points. 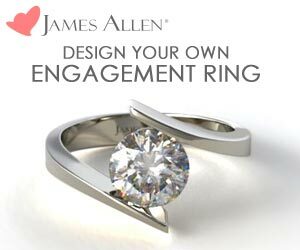 I personally bought my engagement ring from James Allen after doing some extensive research and could not be happier. Not only is the style and cut worth a considerable higher amount had a bought from a European retailer but the advice on hand by them is sure to put any jittery man at ease. The key element for me that sets James Allen apart from Blue Nile (as prices can be similar) is that they have all the diamonds photographed, so you can see the exact diamond that will be adorning your loved ones finger. I was able to see key differences between corresponding diamonds to make sure the ring was clear and had a lot of sparkle. My only note with James Allen would be that men need to be aware of the import duty that needs to be included in your pricing if you are delivering to the UK. Through no fault of James Allen, Fedex sent me a letter (very old school) instead of calling or e-mailing to tell me that my parcel was held up in customs awaiting payment on duty charges. Once paid the ring swiftly arrived the next day. Even with the duty added I did some research and I was still around £1k cheaper than a similar ring available through another retailer. She said yes by the way!